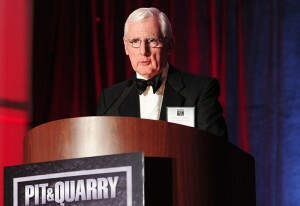 At its annual Pit & Quarry Hall of Fame ceremony, Pit & Quarry announced a partnership with the National Mining Hall of Fame and Museum. Through the partnership, the inductees in the Pit & Quarry Hall of Fame will be featured in the National Mining Hall of Fame in Leadville, Colo. The Pit & Quarry Hall of Fame inductee plaques will be hung near the entrance of the museum. McAllister also hopes to eventually incorporate a digital element to the museum. “[By digitizing the museum,] we’d have the opportunity to not just show the fellow’s plaque, but we could also show a little bit about his life and where he worked and things like that,” he says. P&Q and the Mining Hall of Fame plan to move forward with the partnership in 2015.